We all meet heroes in our lives. Sometimes we just don't recognize them at the time. Today Al Jazeera journalist Peter Greste is sitting in a Cairo prison cell, convicted by an Egyptian court, incomprehensibly, as a terrorist sympathizer for interviewing members of the Muslim Brotherhood. Emmanuel De Merode, Chief Warden of Virunga National Park, survived an assassination attempt in April in the Democratic Republic of Congo. He managed to survive four bullets in the stomach the day before the world premiere at the Tribeca Film Festival of the documentary Virunga that comes out today on Netflix. In this extraordinary film, directed by Orlando von Einsiedel, De Merode stands up to corrupt government and corporate interests as well as the armed rebels and poachers whose activities are threatening the survival of the park and its denizens, the world's largest remaining group of mountain gorillas. All of these groups wanted De Merode dead. How did I manage to find myself involved with these two fearless men? We all worked together on a children's book, of all things, in the wake of the horrific Gorilla Massacre in June of 2007. 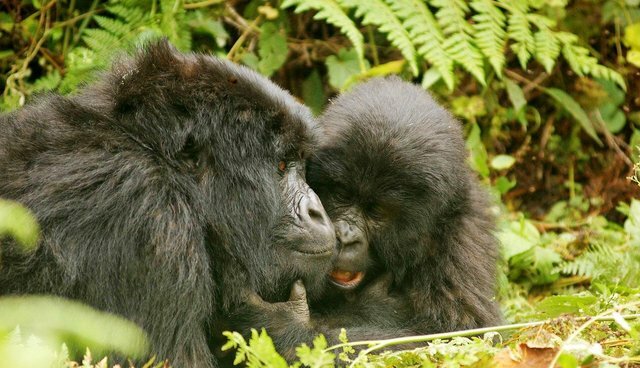 Simply entitled "Virunga Mountain Gorilla Protection Project," the goal of this project, a 2007 Clinton Global Initiative commitment, was to raise awareness of the plight of the gorillas who are 98 percent genetically identical to humans. A lot of bold face names helped in the campaign ranging from President Bill Clinton to Anderson Cooper to Jack Hanna. Just after the Gorilla Massacres, we had gotten word of a number of orphaned gorillas whose mothers had been shot in the massacre. Emmanuel and his organization Wildlife Direct founded by Richard Leakey had worked closely with all of the park Rangers in Virunga. Emmanuel and several ICCN park rangers agreed to lead Peter and a group deep into park to see if they could locate any of the orphans. Virunga had suddenly become the heart of darkness: poachers, warlords and impoverished people who just needed charcoal to cook are disturbing the delicate balance of a fragile ecosystem. At that point, the world's remaining population of mountain gorillas number 720 in total. Without spoiling the plot of the film, Virunga goes deep undercover and exposes severe corruption in the DRC and in Virunga National Park that endangers the future of mountain gorillas and the entirety of this world heritage site. The emotion of seeing Emmanuel, one of the key protagonists in this amazing documentary, was like watching Lawrence of Arabia. Since our efforts in 2007, Peter went on to live in constant danger in his day job as a journalist on assignment on some of the world's most dangerous beats. But of all of the many protagonists in Virunga, no one is more heroic than Emmanuel. Emmanuel went on to become the head of Virunga where, as the documentary captures in real time, he stands his ground as the park is being invaded by the warlords and their armies. This is not as unusual as it should be. 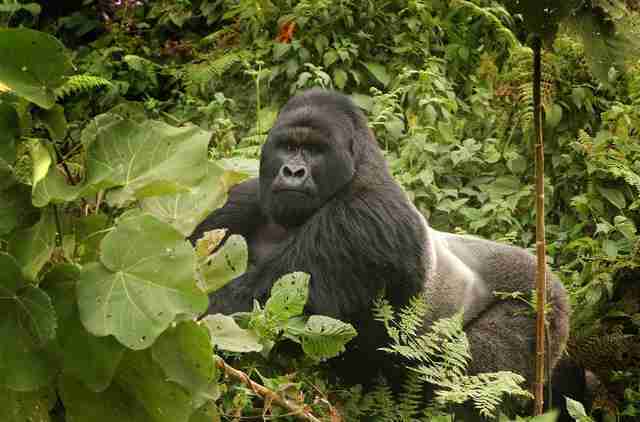 Over the past fifteen years, about 150 park rangers have been killed protecting the mountain gorillas. Like all park rangers, Emmanuel lives each day with the threat of being a casualty of the corrupt corporate interests, war lords and poachers and, yes, even to his own government, who he defied by risking his life for a higher cause. We all have hopes and dreams; my hope is that some day soon I can join up with Emmanuel and Peter for a reunion expedition back into the Virunga National Park perhaps when it is no longer the heart of darkness. Steven Pinker has said that the world is safer now than any time in human history; there are fewer violent deaths than ever before. Yet the world still feels like a very dangerous place. I guess it depends on whom you know and what they do for a living. But we often take for granted the inherent risks and discount the dangers for those truly trying to make the world a better place. 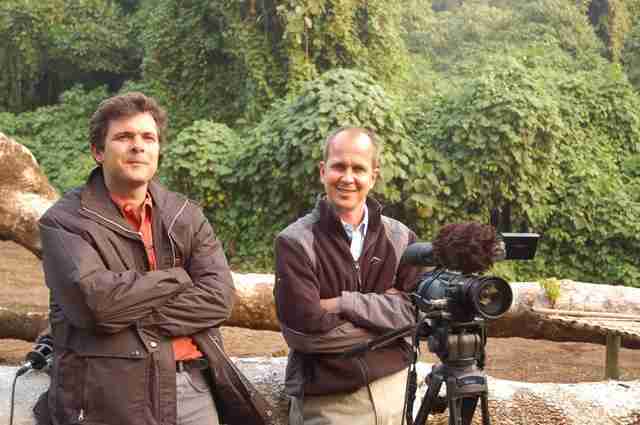 Emmanuel De Merode and Peter Greste, respectively, in 2007.